The UK's leading breast cancer charity has called on Roche to reduce the cost of Kadcyla (trastuzumab emtansine) so that it can continue to be made available via the Cancer Drugs Fund. 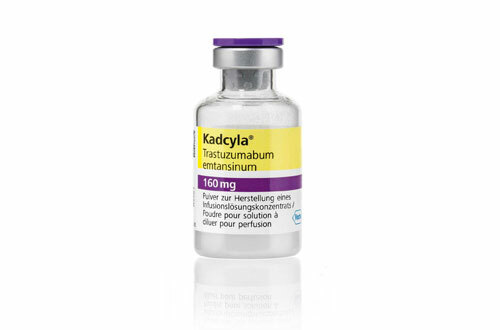 Kadcyla costs around £90,000 per course of treatment and is set to be dropped from the Cancer Drugs Fund after NHS England decided it provided “insufficient value for retention within the CDF”. Breast Cancer Now has launched a petition - the second time pressure has been put on Roche recently over the cost of Kadcyla - demanding Roche drop the breast cancer drug's price so that it can remain on the CDF. Baroness Delyth Morgan, chief executive at Breast Cancer Now, said: “Time is running out for patients living with incurable secondary breast cancer for whom Kadcyla would be their next treatment option. The situation is becoming increasingly desperate; it's time for Roche to act, and make this one-of-a-kind treatment available at a price that the NHS can afford. NHS England is due to confirm its preliminary decision to cut Kadcyla from the CDF on November 4. Deborah Lancaster, director at Roche Products, said the company had already made cost concessions and agreed with Breast Cancer Now that CDF reform is needed. “We have worked hard during this second review to safeguard access to all four Roche medicines currently funded through the CDF. Although only two of our medicines were selected for re-review, Roche offered NHS England £15m of savings, including on medicines not considered for the review, to protect all patients at risk of losing access. She added: “As we have said before, this second round of de-listing speaks to the need to reform the CDF, and we are ready to play our part in ensuring this happens. We need to work together to put in place a pragmatic, flexible and sustainable system - one that puts patients first and one that works for clinicians, government, the NHS, patient groups and companies." After almost a third of drugs financed by the CDF were cut in January and since then Breast Cancer Now said it had been 'flooded with phone calls and emails' from worried patients. The charity wants the government and the pharmaceutical industry to work together to address the ongoing issue of access and pricing for new and effective treatments for breast cancer. But it said the two sides are at an impasse. “Progress has been slow and neither government nor industry are any closer to a solution that works for the NHS, the industry, or for patients,” the charity said. It wants Roche to temporarily drop Kadcyla's price until wider problems with the drug access system can be worked out. There was a six-fold increase in applications for access via the CDF to Kadclya between 2013-14 and 2014-15, when 778 requests were made. Set up in 2010, the CDF was originally intended as a stop-gap measure until the government could replace the existing Pharmaceutical Price Regulation Scheme (PPRS) with a new value-based pricing system. Those plans stalled, but the CDF remained. Two weeks ago the National Audit Office put an official stamp on the Fund's 'unsustainability'. The CDF is due to expire in March 2016 and NHS England is due to begin a consultation on changes to it in the coming weeks, having already signalled its backing for handing control of the Fund to NICE.